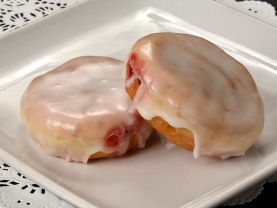 Amon's classic yeast donut filled with raspberry jelly and topped with a thick swirl of icing. 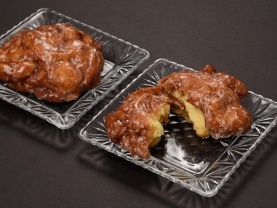 Classic fritter made with apples and topped with glaze. 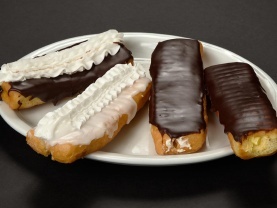 Made from sweet yeast dough and fried, with a chocolate, custard or jam filling and topped with icing or powdered sugar. 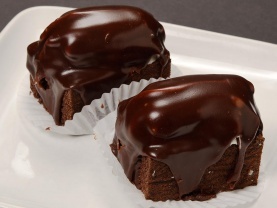 Moist, chocolate goodness and walnuts topped with a thick, chocolate fudge icing. Large glazed, hand-twisted donut with more than a hint of cinnamon. 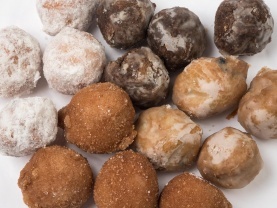 Classic cake donut holes in a variety of flavors, including chocolate, blueberry, coconut, toasted coconut, cinnamon and powdered sugar. Delicious cake batter deep fried and available in a variety of flavors, including chocolate, blueberry and coconut. Buttery dough filled with sweetened cream cheese and topped with a cinnamon streusel. Moist chocolate cake topped with a secret swirl of sugary sweetness and smothered in rich chocolate. 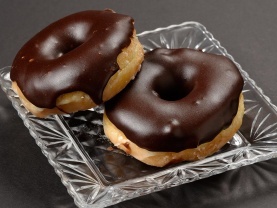 Our classic glazed donut, dipped in chocolate. 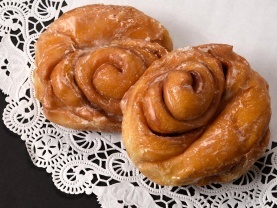 Classic handmade sweet roll with robust cinnamon flavor, drenched in glaze. 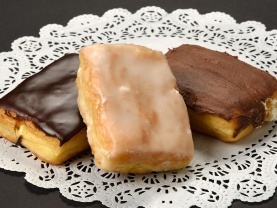 Square donut filled with cream, custard or jelly and topped with chocolate frosting, dipped in chocolate or glazed. 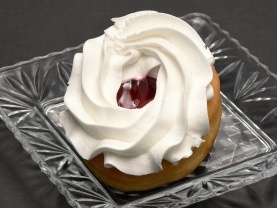 Delectable pastry filled with sweetened cream cheese in the center and topped with Amon's traditional glaze. 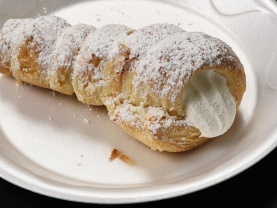 Crispy puff pastry filled with whipped cream and topped with powdered sugar. 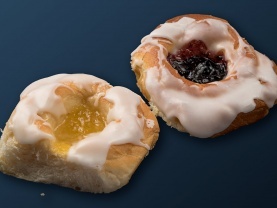 Danish pastry filled with a variety of delicious fruit fillings and drizzled with glaze. 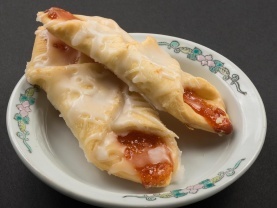 Puff pastry filled with apple or cherry and sprinkled with sugar. 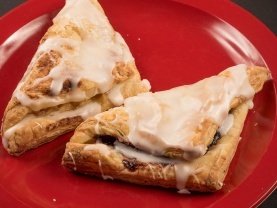 No-sugar added apple turnovers are also available. 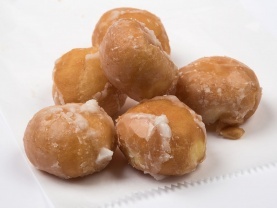 Classic yeast donut holes glazed to perfection. You can't eat just one! 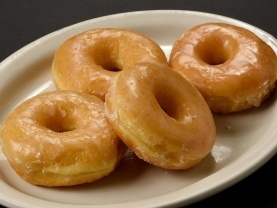 The donut we're best known for, the one and only glazed! Made fresh daily. Be sure to ask when we're serving them hot! 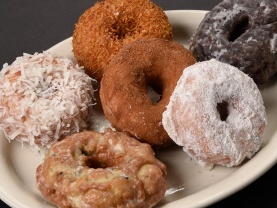 Yeast-raised donuts shaped by hand into a twist and glazed. Bar-shaped donut topped with glaze or icing. The filled variety feature custard or whipped cream in the center. 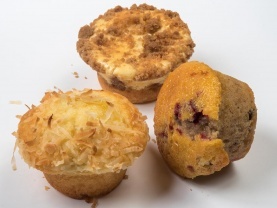 Start your morning with this freshly baked favorite, available in a variety of flavors, including classic blueberry. 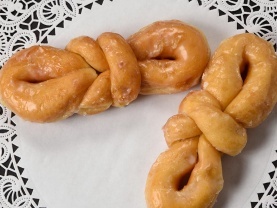 Spiral-shaped, cinnamon/sugar flavored pastry that Amon perfected in the 1950s. Sour cream pastry dough filled with apricot, cherry, blueberry or cream cheese and lightly drizzled with icing. Available only on Thursdays, so mark your calendars! Puff pastry with a mix of fruit and custard sprinkled with sugar.